IHBC members’ services ‘Checkup alert!’: Simple ways to be sure your IHBC NewsBlog email alerts read correctly, and keep up with our latest news, jobs and more! 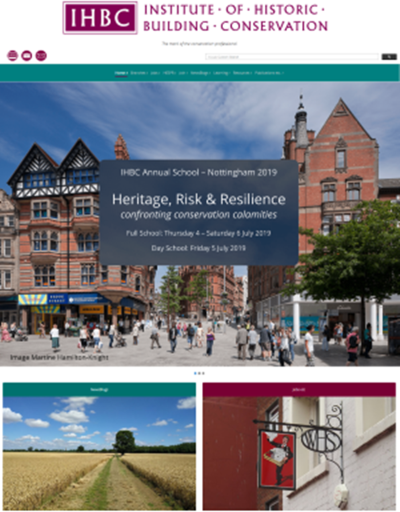 Be sure you are making the most of the IHBC’s services by checking your digital setting – and take advantage of our 30k+ page website, Conservation Wiki, HESPR business listing, IHBC Jobs etc and our IHBC NewsBlogs for all your IHBC and sector updates. IHBC’s resources include our email alerts for NewsBlogs and IHBC Jobs etc which are open to members and non-members* and, for our members, the Membership Eletter which is our primary way of keeping our members informed about IHBC’s core activities. If your email is in text only (without images and embedded urls) check your preference is set to ‘html’ and not ‘text’. Click on the ‘update subscription preferences’ link at the top left of your NewsBlog email that takes you to your Profile page. Check your ‘Preferred email’ setting at the bottom right. If this is set as ‘text’ then click on ‘Edit’ – a box will appear giving you the choice to change it to ‘html’. If there are no images but everything else is visible, then you might also see this message – ‘Images are not displayed. Display images below’. To view the images, click on the link ‘Display images below’ (the text may vary according to your email provider). If you are not getting any of the alerts you’ve signed up for then please check your SPAM or JUNK folder and mark any you find as, ‘Not SPAM’. You should also add ‘contact@ihbc.org.uk’ to your address book or ‘trusted’ list to ensure we don’t keep ending up in the SPAM.